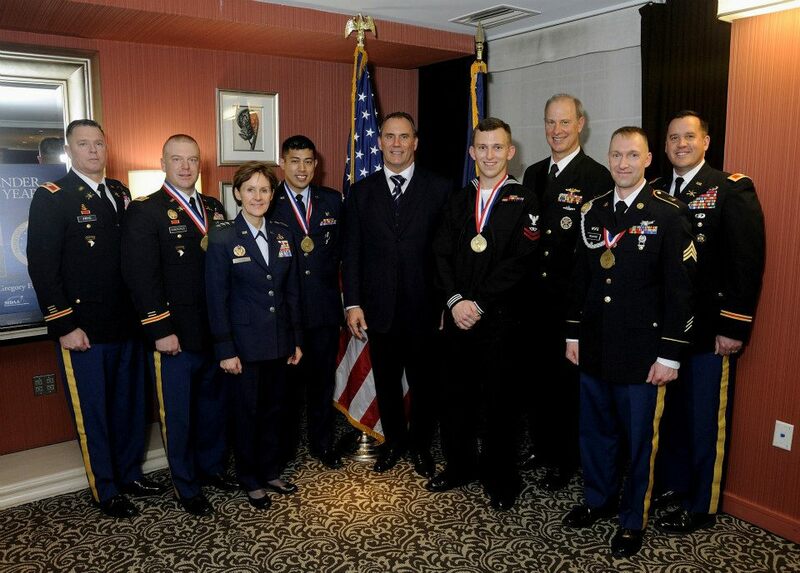 On January 11th, 2013 MDAA was honored to host the second annual “Missile Defender of the Year Award Ceremony” in Alexandria, Virginia. The Missile Defender of the Year is awarded to the best U.S. missile defense Solider, Sailor, Airman, and National Guardsman for the year. These four select individuals represent the best in leadership and personal effort, demonstrating their commitment to excellence and their critical role in missile defense. They are an inspiration to their subordinates, peers, and superiors. The sincerity, heartfelt passion, awe of appreciation, self humility, and love of missile defense was on full display as these young men were recognized as heroes in the unsung field of their profession for all they do for our nation. Sergeant Aric Wilkins Captain Kyle Kirkpatrick, Capt. Gregory Tengco, and Fire Controlman Second Class Petty Officer Ronald Barbee are four men who lead by true excellence, which is contagious to their units, teams, and commands. These four outstanding young men represent their unit or ship as extensions of all those that they work with and the missile defense systems they operate. They represent the best of the military’s current and future missile defense capability to make our nation and world safer. We commend their role and those of our military war fighters who bring these missile defense systems to life to operate, command, defend and protect against the growing and current threats of nuclear proliferation and ballistic missiles. Their future is our future as a nation, a military, and a missile defender; upon their shoulders lay responsibilities that match expectations to achieve much more greatness than what they are recognized for this past year. Yet their climb to this level is and always will be upon their teammates, battle buddies, shipmates, parents and, most importantly, their partners in life-their three wives. We honored these men with affection and tribute for what they have done and also for what they are about to do. The United States military presenters to the award recipients from the respective services were COL Ted Hildreth of the 100th Missile Defense Brigade, United States Army National Guard, COL (P) Donald Fryc, Commandant of the Air Defense Artillery School of the United States Army , Lt. Gen. Judith Fedder Deputy Chief of Staff for Logistics, Installations and Mission Support of the United States Air Force, and Vice Admiral William Burke, Deputy Chief of Naval Warfare Systems of the United States Navy.